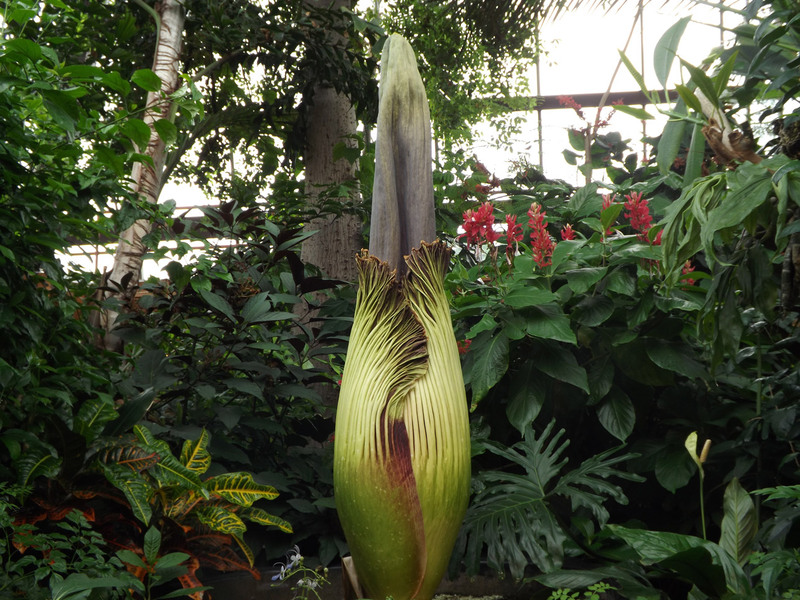 The Niagara Parks Floral Showhouse is bursting with excitement about Clive, one of our biggest Titan Arums, as an enormous flower bud continues to grow taller and wider each day. Our Giant is in Bloom! The giant flower bud is now growing about 3” each day and is already an amazing 4 feet 10 inches tall (as of June 22nd). When Clive last bloomed three years ago, it reached an astounding 7 feet 2 inches above the soil level. View Clive as he blooms as part of your admission to the Floral Showhouse. 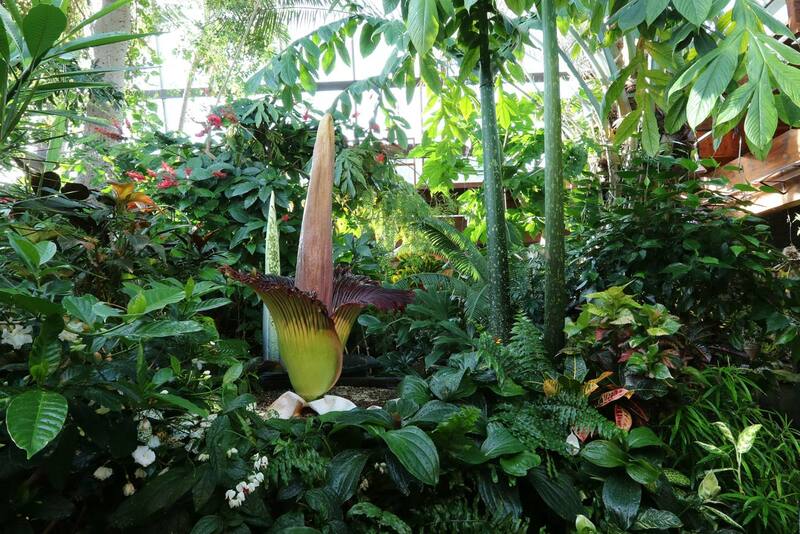 What is an Amorphophallus Titanum (Titan Arum)? 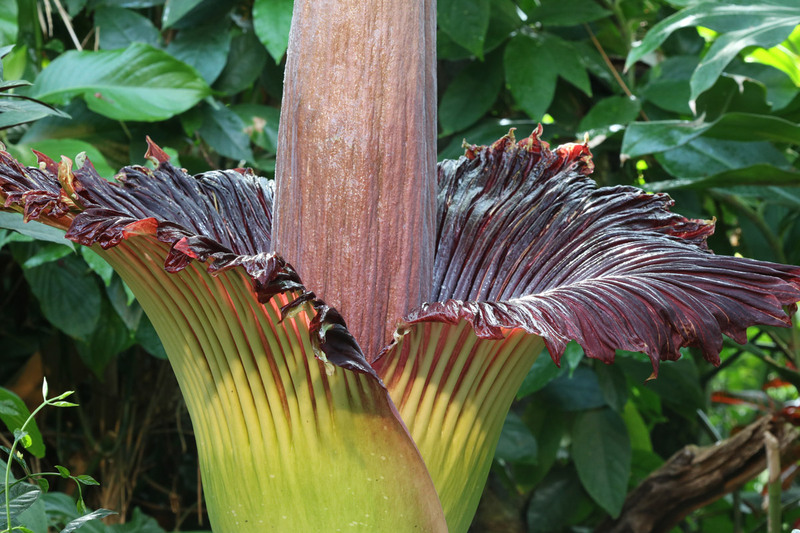 Titan Arums may be impressive because they are the world’s tallest (un-branched) flowers, but they also have one of the foulest odours in the plant world. In their native, dense jungles of Sumatra, Indonesia, the plants pollinate by using their scent to attract carrion-eating beetles and flesh flies. The potency of the aroma gradually increases from late evening, when the flower fully opens, until the middle of night and then tapers off as morning arrives. Analysis of the smell has revealed chemicals like those from the scents of limburger cheese, garlic, rotting fish, sweaty socks, and mothballs. Luckily for Floral Showhouse visitors, the longer the flower stays open, the more the scent fades. The deep red colour, fluted texture, and warm spadix (the flower structure that towers skyward and looks like squashed French bread) all contribute to the illusion for insects – that the flower is a piece of meat. A Titan Arum grows from the water and nutrients stored in its large, underground corm (like a huge, round potato). As the plant grows, the corm gets larger, and after about 10 years, can reach blooming size. Titan Arums have three stages: dormancy, vegetative with a single leaf, or flowering. The dormancy and the leaf stages can last from four months to over a year. The flower bud takes about four months to develop and then blooms for about one or two days. 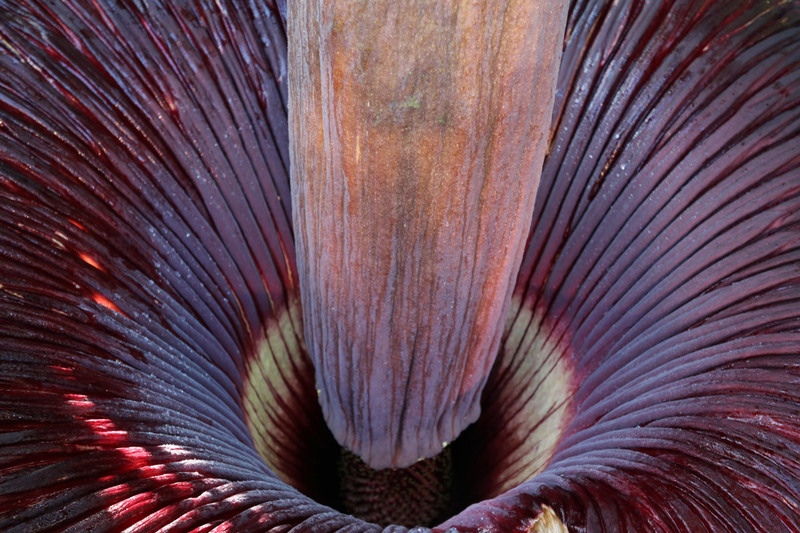 Clive, one of the Titan Arums at the Floral Showhouse is now in bloom — only for the third time since 2012.